I would like to wish all of you a happy and prosperous new year. I don't know what prosperous means, but it goes with the saying. and continue to keep our paws crossed that all furry kids find forever homes. We are gonna watch the Rose Parade too!!! THAT is a grrreat way to start the new year. Hope your year is PAWsperus too. Hi Benny, Lily, and 'da mama! Wesa think your resolutions are fantastic. Wesa wish you all a blessed 2013. I think I will add "eat more cheese" to my list. Happy New Year. Great list Benny, we forgot eat more cheese also, and Bites will try to quit barking at the TV! A Wonderful 2013 filled with fun and laughter and much joy. With your outfit yesterday we thought for sure you'd still be dancing the night away! Happy New Year! Happy New Year 2013 to you and your Family! Love the photos you both look sooooooo cute! I just love your squishy faces! I like your New Years Resolutions, the eating of more cheese is my favorite one and I too will be crossing my Puggy Paws for those dogs in need of forever homes! Happy New Year to both of you, but I think your elephant needs a rest. We join you in wishing loving homes for all the fur kids out there. That would be amazing! 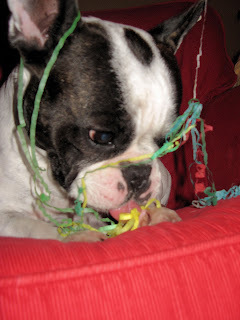 Happy New Year to our favourite Frenchies and Mom! ps, that is the sort of resolution we can live with. Oh, those are some great resolutions!! Monkey noises are funny! I do the same things when I hear doggies bark on TV! Have a great New Year Guys! Eat more cheese? That TOTALLY sounds like a resolution we can keep! We won't make monkey noises at the teevee, but we can't promise that we won't bark... Happy New Year! We agree with your New Year's wish. Have a warm and blessed New Year! But if we don't make noise at the door bell or tv, who will? Lot's and lot's of cheese we say! Happy 2013 Benny & Lily!!!!! Happy New Year, Benny and Lily! Yappy new years! "Prosperous" means more bacon, which is always worth aspiring too. those are darned good wishes for the New Year! Happy New Year to you...oh and I would love to hear those "monkey noises"
Those are some great wishes, Benny & Lily. We especially like the last one. ...oh, and the doorbell one. Happy New Year! Great resolutions. Totally on board with the cheese thing. Henry is resolving to eat more treats. Happy 2013! Happy New Years! we wish you a fun and healthy 2013! It looks like it was a fun pawty. Happy New Year. Eating Cheese sounds fabulous! Why didn't we make any resolutions this year! We will definately work on the eating more cheese thing! Wow, I watched the parade too! How fun. I really like that cool elephant on this post. My resolution is to do a better job of training my peeps...they need some work! Happy New Year to you and lots of wishes for a fun 2013! Those are some great resolutions. You and your family have an awesome new year!